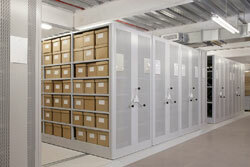 Saving space, maximizing storage capacity, reducing costs and controlling unauthorised access are the constant concerns for managers of archives, broadcasting (media, magnetic tape, film cans) and storage facilities. Archives, films, tape, videos, discs. We can store everything with our media shelving system. Euromech has the largest portfolio of storage shelving products for fixed and high-density mobile storage systems. Archives shelving for storage of archival boxes, media shelving for storage of magnetic tapes and film cans, Euromech’s high density shelving systems are renowned to be the smoothest and safest systems in the industry.